Abby, left, and Peanut, right, are just two of the more than 150 animals expected to be up for adoption at an "Adoptapalooza" in Long Island City on Sunday. 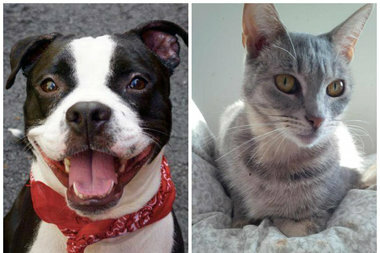 LONG ISLAND CITY — Dozens of dogs and cats will be up for adoption this weekend, at an 'Adoptapalooza' event that'll also feature face-painting and pet photos. The Alliance for NYC's Animals, a coalition of city shelters and rescue groups, will host the adoption event Sunday from 12 to 5 p.m. at the Koeppel Subaru Dealership at 42-01 Northern Blvd. in Long Island City. It will feature more than 150 adoptable animals, plus activities for current pet owners, who will be able to take a picture in a photo booth with their furry friend or get their dog licensed by the Health Department, according to a press release. Animals looking for a home include Jazzy, a 3-month-old black kitten described as "gentle, sociable, and affectionate," and Dainty, a bilingual pooch who understands both English and Spanish. A list of other pets expected to be at the event can be found here, or on the Alliance's Facebook page.